In the United States, the Summer Retreat program is drawing to fruition. The fortunate students who were able to spend a month at the retreat center in the United States had the opportunity this weekend to enjoy Lama Dance. The retreat is the same as the Buddha in the Palm of Your Hand (Sangye Lak Chang), revealed by Tertön Migyur Dorje, which our late root teacher, His Holiness Penor Rinpoche, worked so hard to preserve. Those familiar with His Holiness’ biography know, that if it were not for His Holiness’ efforts in collecting the scattered texts back together, the retreat would not be possible. (Read more). As according to His Holiness’ instructions and with his blessing, His Eminence Khentul Gyankhang Tulku Rinpoche granted all the Nam Chö empowerments as well as the Nam Chö Ngöndrö teachings and instructions. 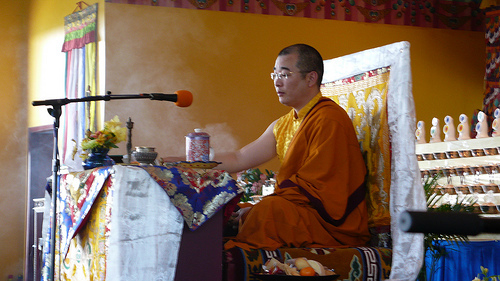 Khen Rinpoche Tenzin Norgyay gave teachings and instructions on Tsa Lung inner heat practices. Khen Rinpoche Tsewang Gyatso granted the Tsa Lung empowerment (a prerequisite for students wishing to take the Tsa Lung course), as well as all the Dzogchen instructions for Tögyal and Trechö. This is the thirteenth year of retreat as our late Holiness Penor Rinpoche started this retreat in 1998 It has continued until now unbroken, with the blessings of the lineage. Meanwhile, in Namdroling Monastery in South India, the monks continue to follow the traditional rainy season retreat known as “Yarney.” During this time period, the monks do not go out of the monastery, but remain in practice for one month. On 3rd March 2010, the eighteenth day of the first month of the Tibetan calendar, according to the Palyul tradition, one month retreat of Ngondro, Tsalung and Dzogchen was started. His Eminence Gyangkhang Tulku Rinpoche, Khenchen Tsewang Gyatso and Khenchen Pema Sherab are bestowing the Ngondro, Tsalung and Dzogchen transmission respectively. Like every year, many monks, nuns and lay persons are participating in this retreat.